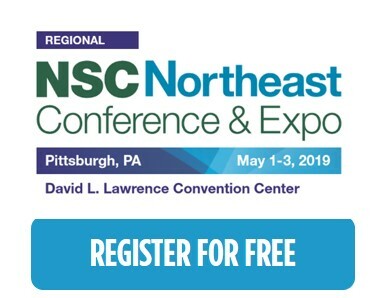 Free Registration for the NSC Northeast 2019 Conference & Expo! Visit us at booth# 206! The NSC Northeast 2019 Conference & Expo is your opportunity to meet with like-minded safety, health and environmental professionals. This annual event allows the safety, health and environmental community to build off each other’s strengths, resources and passion for safety excellence. Drop by our booth and be welcomed by our friendly staff – they’ll let you demo our no-tools-required pallet rack safety products. Perfect for manufacturing facilities, warehouses, distribution centers, or any place using pallet racking. We’ll also show you our line of cargo restraint nets for every style of truck in your fleet. Click on the “Register for Free” button or click here. Select “Member Type” and select either “Register with Member Number” or “Register as a Non-Member”. Complete the requested fields then click “Start New Registration”. Note: the free pass code is already added. Follow prompts to complete registration for the Expo Only Guest Pass.